Booking a ticket for my Chennai-Madurai leg was no less than a heap of confusion. 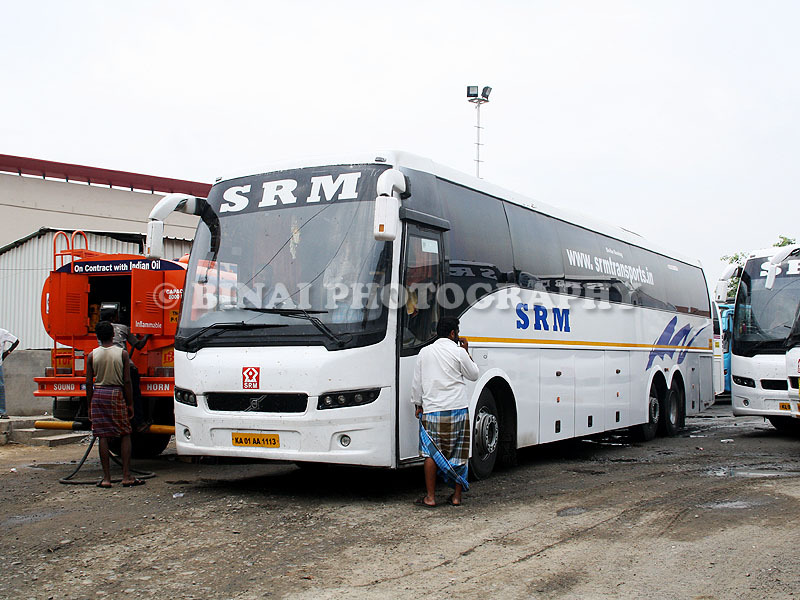 I had three day journey options – SRM, KPN and Parveen (in the order of departure time). 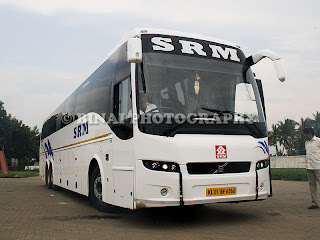 I have never tried the services of SRM or Parveen – so the tie was between them. SRM departs at 0955hrs, while Parveen leaves only at 1315hrs. I initially booked on Parveen. But later, the late arrival at Madurai gave me jitters, as it could jeopardise all my further travel plans. Not wanting to take the risk, I cancelled the ticket in Parveen and booked in SRM. I and my friend Jayasankar were travelling together. The cancellation process in Parveen was a bit confusing – the website kept throwing tantrums very often. Finally, at the end, the ticket got cancelled, but I got no refund! Their customer care centre in Chennai was very helpful in sorting out the issue, and my refund was arranged through their Bangalore (Madiwala) office. After the journey from Chennai, I quickly freshened up and got out for some bus fanning. 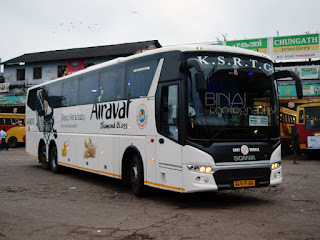 First on the list was some time at CMBT, and later at Chennai Contract Carriage Bus Terminus aka Koyambedu Omni Bus stand. The bus station was no better than a garbage heap – it was slushy all around, and garbage was strewn all around. The buses were parked in puddles of dirty water. After a very short stint, I was horribly disgusted with the experience and I walked out. Jay reached the place around 0845hrs. We headed to A2B for breakfast. A2B, as ever, was an overpriced choice. After breakfast, we headed straight to the SRM bus terminus. The bus station was chocked with buses parked in every corner. There was no clarity on where my bus was – whether it had already gone for pick up at the Omni bus terminus or if it still was at the garage. There was no staff to guide us, except that gatekeeper who asked us to head to the waiting area. An SRM B9R being refueled at the parking. SRM gets fuel in tankers fitted with dispensing instruments (including meters). The buses are refuelled at the garage itself. There was a long line of buses outside waiting to be parked inside, as the tanker blocked the entrance into their parking yard. My bus for the journey ahead was parked in front of the waiting area – the engine was on, and they were running the AC too. Boarding had not yet commenced. The waiting area is a crudely made waiting shelter – similar to the ones we find in most government bus stations. There were a couple of dogs for the company of passengers. I got a couple of bottles of water from a shop outside, since I wasn’t sure of SRM giving water bottles. My bus was parked in a puddle of water – so no way to boarding it until they moved it ahead. Around 0940, they moved the bus (KL-01-BF-6568) ahead, closer to the gate and started boarding. The cleaner did not want to keep passenger baggage in the dickey – my friend had a fairly big bag, and we wanted to leave it in the dickey – but the cleaner wouldn’t budge. He said only passengers beyond Madurai should leave their luggage in the dickey – couldn’t understand the logic though. Most passengers (more than 70%) were to Madurai too! I noticed that the bus had iShift transmission as I got in. The interiors were clean – the colour scheme was a bit dull though. Interiors were well kept, and the bus did not show signs of aging (it was not more than 6 months old anyway). The bus finally started from there at 0945 – the bus had around 15 passengers as we started off. Water bottles were kept in the bottle holders already – 500ml bottles of an unheard brand. I was happy to have bought water bottles, since 500ml bottles wouldn’t last long anyway. The bus headed next to the Omni Bus station for pick up. The road was in horrible shape, and the bus was swaying badly even as we were doing less than 20kmph! The road takes a bad toll on the suspension for sure. The bus: KL-01-BF-6568, taken during lunch break at Ulundurpet. Lights on request. We stopped outside the bus station at 0958hrs. The pickup was quite long. A guy from the office checked tickets of all passengers inside the bus in the meantime – they took the tickets with them after checking. We started from there at 1007hrs – with around 30~35 passengers on board. After this pickup, the bus directly headed towards the bypass road. A movie was played as the bus entered the bypass. This was my first long journey in an iShift B9R. I, honestly, did not find anything special in the bus. The gear shifts were similar to the ones in manual transmission – the lag and the kicks were present too. 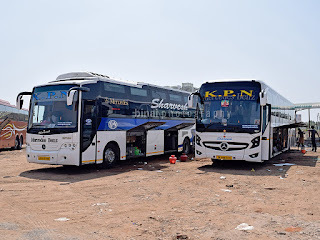 While braking, though, one gets a feeling similar to that in the Automatic transmission buses – the gear comes down going through each ratio, unlike in a manual transmission where the driver just brakes and later downshifts to the appropriate gear directly. The bus had two drivers and one cleaner – the drivers were in uniform, while the cleaner wasn’t. The first driver was very quick, with shades of being rash. He was blowing the horn continuously – it was seriously irritating. His style of driving gave a lot of “pulling” effect. He kept hitting three digit speeds wherever the situation permitted him. The top speed recorded on my GPS was around 120kmph (I could not track the entire route due to low battery in my phone). There was heavy traffic after we exit the bypass. This was my first journey in this route and my first every visit to this part of Chennai. We reached Perungulathur at 1042, and left at 1044 after picking up a few passengers. After this, we stopped again for pick up at SRM University – at 1101hrs. The crew got off here and we doing something at the office. After taking in a couple of passengers, we got moving at 1104hrs. This was the last scheduled pick-up. After the pickups, the driver got back to business, and was driving very fast. I concentrated more on the movie, as the surroundings got barren. Except the railway line which ran parallel, I did not find anything much interesting. I dozed off for a while. The bus stopped somewhere in the middle of nowhere for a bio break – it was at a barren place, under the blazing sun! I dozed for some time, and later concentrated on the movie! It was an interesting movie starring Karthi. The movie had a lot of interesting moments that kept most passengers glued to the TV screen. As the first movie got over, they played another movie. The bus got into a hotel at Ulundurpet (I forgot the name of the hotel – this hotel had a KPN office too) for lunch, at 1304hrs. The toilet here was absolutely run down, and they were charging passengers for using it! The restaurant had absolutely horrible service – the bearer did not turn up for quite a long time. He turned up after some passengers started shouting out. The service was absolutely unacceptable. To add salt to the injury, the driver got back to his seat and started blowing the horn very impatiently. I hurried through my lunch and rushed back to my bus. We started off from there at 1331hrs. The second movie was now playing. This one wasn’t very impressive – the script was too hard to digest. We reached Trichy at 1504hrs – dropped a few passengers and then started moving at 1505hrs. After getting back on the highway (we had stopped below a flyover earlier), the bus stopped again, this time for a bio-break (1509/1512hrs). The driver changed here. The second guy was far more disciplined and relaxed compared to the earlier guy. This fellow was fast, but was not rash. I loved his driving style – just enough use of horn, and proper style of picking speed. Honestly, I felt that this bugger was crawling, but we were doing three digit speeds – now that is called a good driver. The entertainment system was switched off after the movie got over – they did not play any songs (thankfully), allowing for some cool relaxing moments. 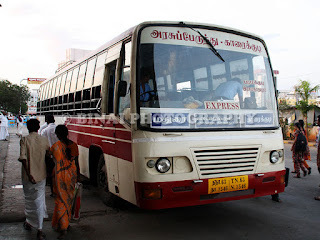 I realised that we neared Madurai when I spotted some city buses around. The bus went around the High Court of Madras, Madurai Bench and proceeded towards Mattuthavani. The bus stopped outside the Mattuthavani Integrated Bus Terminus, Madurai at 1635hrs. The crew shouted out that this is the last stop for Madurai. I enquired if the bus would drop us at Periyar (which mentioned as the dropping point in the ticket) – the cleaner gave a blunt No. 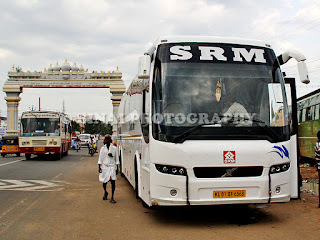 I took a couple of shots of the bus, and we headed off to MIBT’s City bus section to take a bus to Periyar. After dropping me at Madurai. That is a "Welcome to Madurai" arch in the background. Remarks: The bus, KL-01-BF-6568, was fairly we kept. There were dents and signs of patch work on the bus – but that is normal for a vehicle running on the road. One side window glass in the rear half of the bus, right side, was broken, and they crudely pasted some kind of a paper/plastic sheet on it. 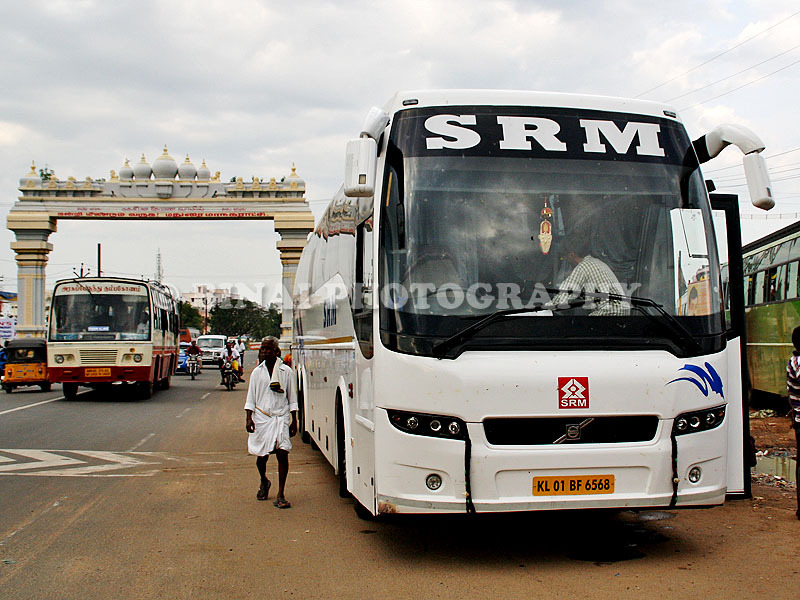 The overall maintenance was good – the bus had done around 1.4 lakh kms, but not rattles or squeaks. The crew behaviour was good – not exactly excellent though. The run time (6h 28m against an estimated 8h) was good. The first driver was often rash, with excessive use of horn. The second driver is whom I’d call a good driver – really fast, but not rash or scary. The passengers inside did not feel the speed. A small word about the reservation website – the website worked very fine. What I liked the most was a very professional ticket output – no advertisements or excessive use of graphics. It was plain and simple. Will I take this service again? Well, that depends. I rarely travel to Chennai, and this trip was a one-off trip. But, I would surely try SRM again to see if they stand up to their reputation (or projected reputation). After a few mixed bag experiences, I now feel it’s better to make an impression after at least two rides in an operator, preferably on different routes. But, SRM surely stands another chance. A nice review on SRM. Often I had heard of their rash drivings. The pulling effect I think occurs to most drivers when they rash- in TVM G4 I have seen this most(driver was ex srm) but they seemed to know how to handle the bus.